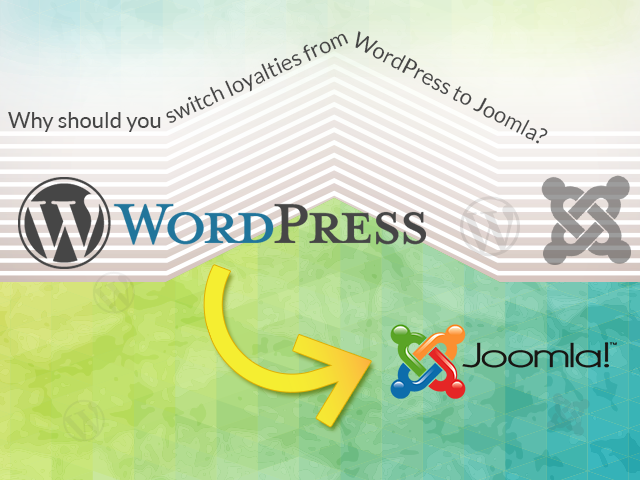 Why Switch from Wordpress to Joomla? Diehard WordPress fans might not like this title or the idea behind it. But I assure them that by the time they finish reading this article, they shall be thoroughly convinced that the time has arrived to migrate to Joomla from WordPress. For many CMS users the whole idea of converting their website from WordPress to Joomla might sound preposterous and understandably so, considering the fact the WordPress is the most popular and widely used CMS tool. It commands 60% CMS market share with Joomla lagging far behind with its meagre 9%. WordPress is the automatic choice for professional as well as home based CMS users. Being well documented and having a long presence have ensured that online tutorials for WordPress are available in plenty. The same however cannot be said about Joomla. But wait before you jump the gun and draw your line. The reason why I say this is because the all new Joomla 3 is a CMS tool to reckon with. It is more responsive for site users as well as administrators. Released in 2012, Joomla 3 uses a Bootstrap framework and a LESS processor, making it ideal for front-end designers as well as web developers for creating consistent interfaces. What’s even better with Joomla 3 is that the team Joomla has tried to make a conscious effort of improving the overall user experience right from the word go. Its refinement starts with the instant installation process and continues up to its very core. A user is shown a variety of sample sites to choose from, before beginning. Even for those users who aren’t fans of Joomla or are radically dedicated to WordPress, maybe it’s time to give Joomla 3 a fresh look. Putting together a Joomla 3 based website on its feet hardly takes time. But in case you are still not convinced to switch over to Joomla 3, here are my 5 compelling reasons to do so. A WordPress site requires customization and add-ons for going multilingual. Joomla 3 on the other hand does not require complicated add-ons for creating multilingual sites, as it takes care of this problem during the installation process itself. All you have to do is to install other languages in addition to English during the installation process. Joomla 3 provides an option of choosing from 60 international languages. Supposedly you have a site in English and German, and you write and post an article, you will get the choice to label it either as “English”, “German” or “All”. In case you label the article as “All”, then it shall be displayed as it is and irrespective of whether a user is viewing the site in English or German. You can create a German translated version of the same article and label it as “German” and link it with your English version article. You also have the flexibility with Joomla 3 by not choosing the translation option, in case you need separate content for both language version sites. Joomla 3 based multilingual sites are easy to create, manage and understand. The (RAD) Rapid Action Development framework is a welcome addition to the core code of Joomla 3. This framework offers unique advantages as a user has to interface with the framework rather than with Joomla directly. The RAD framework has been built on top of the Joomla platform and acts as its extension, rather than replacing it. Writing Joomla extensions will be the same as it was earlier. While writing Joomla extensions, a web developer will have to write just about half the code due to the RAD framework. Extensions which are created with the framework require just half the files and code in comparison to the previous Joomla version, while ensuring backwards and forwards code compatibility. The RAD framework is built on the (DRY) Don’t Repeat Yourself principal. Bootstrap and jQuery are used in the framework which provides web services and JSON support. The Joomla 3.3 is the first totally responsive CMS tool available today. It uses the Twitter Bootstrap framework for creating mobile friendly and responsive sites. Bootstrap is a powerful front-end framework for developing websites in a faster and an easier way. A Joomla template prototype can be created without the need of a customized CSS or UI and thus a developer can focus his attention on features and user experience. The version control feature of Joomla 3 is a very important security feature which saves a copy of all your content every time you make changes to your site. By clicking on the version button on the toolbar you can browse and see the previous saved versions of the article. Every time you save an article a new pop-up opens allowing you to make changes to the article. Joomla also uses a clear cut colour scheme for editing. Removed text is marked and red while green denotes the text which has been added. Joomla not only stores the articles but also the settings of your content. In case changes are made to an article, Joomla stores the previous settings and a user can roll-back as and when he chooses to. Joomla also has a feature for creating a setting for limiting the number of versions it can store. This feature is more beneficial for sites with a large amount of database and where frequent changes are required. The most innovative and unique addition to Joomla 3 is its install from web features. Joomla extensions can be downloaded from the administrator area of your Joomla site. The system works much like the Google play but the only difference being that it works only for extensions. Around 8,000 extensions are available for download and a user can review them, see their screenshots and ratings and then download them. You can find and download photo galleries, shopping carts and calendars from there. The (JED) Joomla Extension Directory, which was used in the previous versions of Joomla have formed the basis for creating the install from web feature. Although WordPress is a popular and easy to use CMS tool, it has a number of shortfalls as well. It requires loads of plug-ins to enhance the functionality of sites created through it. Joomla on the other hand comes with built in plug-ins, requiring little botheration for users. Time might not be far when the market share trends of both CMS tools start reversing and more web developers start switching their loyalties towards Joomla 3. Many web development companies provide web design services in Australia. But the service quality Kristy Bernales provides is a class apart. She works at Webdesign Xperts, Melbourne as a web developer. She is a keen listener and an orator. Read her enlightening posts on Facebook and Twitter.